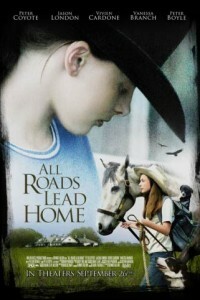 The movie “All Roads Lead Home” is not so much about life, but about the absence of life that comes with great tragedy. Yet nature has a way of providing direction. Pointing left or right. Posting signals that ultimately bring everyone back together. A journey that starts and ends at the same place. Yet must be traveled before healing can begin. There’s romance and comedy. Tears and anguish. Touching moments and troubling prospects. Life and death take on new meaning through mysterious pet deaths, budding romance, hidden motivations and the human need for love and understanding. The child, her father and grandfather are joined by a veterinarian who solves mysteries and brings love back into the equation. A farm manager who isn’t at all what he appears. A motel owner who adds a mixture of humor and common sense to the evolving story. Plus dogs and parrots and horses, oh my. This is a movie that will make you laugh and cry. Make you question certain beliefs, yet confirm others. Like the films’ title, various sub-plots all lead back to a single conclusion. A single truth about family, love, precious life and the detours that can and do, lead to a better place. “All Roads Lead Home” might appear to be a simple map to follow. But the journey is what brings this family back together. Beautifully scripted, filmed and acted, this movie will touch your very soul and make you a better person for the viewing. And, after all, isn’t that what great story telling is all about?